There are some nice fishing lodges on Eagle Lake with excellent accommodations at reasonable rates. 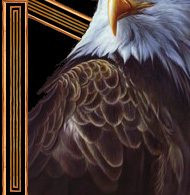 You can be a guest at these lodges and still hire Eagle Eye Guiding to guide for you, whether it's just for one day to get to know the lake or for a whole week. Eagle Lake is one of the largest lakes in Northwestern Ontario. Its diverse structure combined with healthy weed-beds and countless feeder-streams produce game fish in great numbers and sizes. Walleye fishing is outstanding with guests catching between 20 and 50 Walleyes in a day. 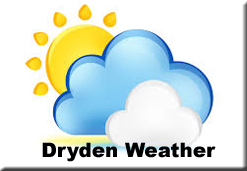 Guests also commonly catch large trophy Walleye in the 8 to 12-pound class with a few each year reaching 14 pounds. 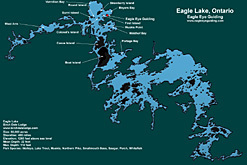 Eagle Lake is also the birthplace of the slot program for Northern Pike and Muskie. This conservation method has been in place for over 10 years and now our guests are astounded at the numbers of Northern Pike in the 15 to 25-pound range that are being caught. This could also be said about Muskie, which is what Eagle Lake is famous for. 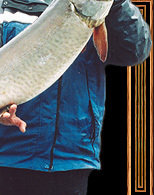 Eagle Lake has a 54-inch minimum because of the availability of giant trophy Muskie. Eagle Lake produces unbelievable numbers of Muskie between 40 and 45 inches with quite a few each year in the 50 to 56-inch range. Eagle Lake is also stuffed with Lake Trout, Smallmouth Bass and Perch. Lake Trout in our lake have an astounding average size of 8 to 10-pounds. Small good eating size Lakers and big trophy Lake Trout up to 30 pounds are available. Perch are everywhere and can be found in great numbers. 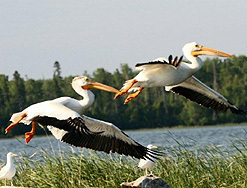 Eagle Lake is one of the most scenic areas of North-West Ontario and is home to Vermilion Bay Lodge. Nestled on the north-west shore of Eagle Lake, our lodge is just a short drive from the village of Vermilion Bay. Fishing Eagle Lake, Ontario for Walleye, Northern Pike, Muskie, Smallmouth Bass, Lake Trout, Jumbo Perch and Whitefish ... all on the same lake! You can see from the map of Eagle Lake that the diverse structure, size and volume of water will give you enless bays and waterways to explore. This is what makes Eagle Lake one of the best trophy lakes in Ontario for Walleye, Muskie, Northern Pike, Lake Trout and Smallmouth Bass.